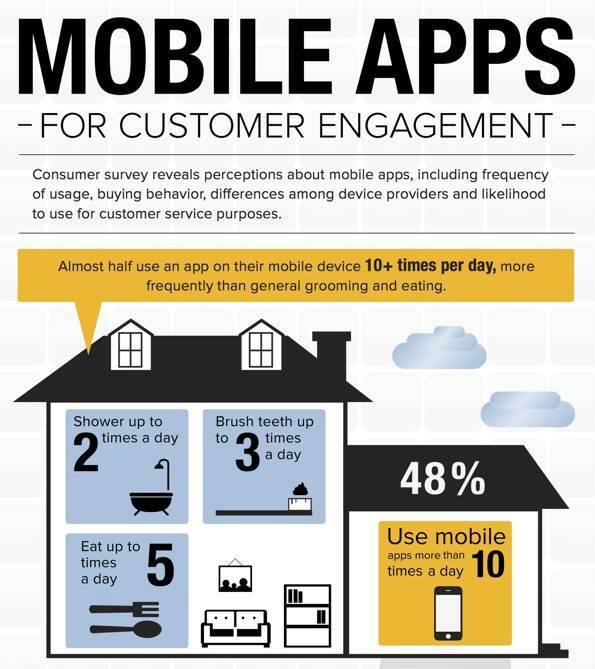 While stumbling around the internet I came across this very interesting infographic, put together by ClickFox on the effectiveness of mobile apps for customer engagement. For businesses looking to engage with customers it offers some interesting insights, and might guide you to a slightly different solution from that which you had originally planned. Some of the “stats” are just a bit silly. For example, comparing how although almost half of those surveyed use mobile apps more than 10 times a day, they only shower up to 2 times a day, and brush their teeth up to 3 times per day. Taking conclusions from these seems a little on the silly side. Silly stats aside, it does tell you quite a few things you need to know. For example, 73% of the respondents use apps to make purchases or assist with a buying decision. Not surprisingly, Apple users lead the pack here with 81% saying they use apps in this way, followed by 72% of Android users. BlackBerry users are apparently too depressed over the state of RIM to be thinking much about buying anything, only 63% said “yes” to this one. The numbers for the infographic are taken from ClickFox’s “Mobile Apps Consumer Survey” from October 2011.